I have a soft spot for enchiladas and like every kind I’ve ever had: my Aunt Shirley’s enchiladas filled with onions and ground beef; Mexican-American doozies oozing with cheese; earthy combinations of squash and peanut sauce; and the fresh-fish-and-green-salsa variation served at my neighborhood taqueria. 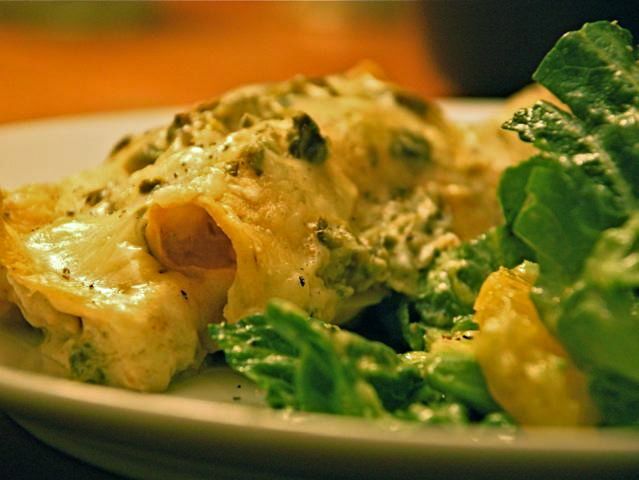 This recipe for green enchiladas suggests pure comfort food and makes me think of my mom. In a medium skillet, heat the oil until it sizzles when a drop of water touches its surface. Fry tortillas one at a time, for 15 seconds on each side, turning with tongs. On a plate lined with paper towels, drain the tortillas. To assemble the enchiladas, place about 2 tablespoons cheese, 1 tablespoon onion, and, if using, 2 tablespoons shredded chicken in the center of each tortilla. Roll tortilla into a cylinder and place seam-side down in a 12-by-7½-inch pan. In a medium saucepan melt butter, then whisk in flour. Add stock, whisking it smooth, and continue to cook, stirring constantly, until the sauce thickens and bubbles. Stir in sour cream and chiles and cook until heated through. Do not boil. Pour sauce over tortillas in baking dish. Bake for 20 minutes, then top with remaining cheese and bake for an additional 5 to 10 minutes. Serve warm.